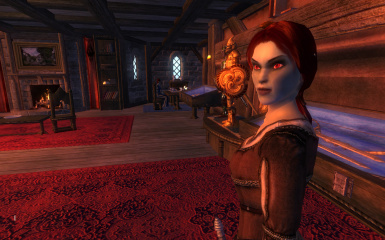 Includes: 2 Female Dunmer Servants (Sisters), a pet cat, and Boney - the Alchemy-Sorter skull. Boney Sez: "I heartily recommend these products or services". Belda Elysium would not be the same were it not for the hard work of the following mod makers. These cats are adorably. Without which Chemie would not be possible. Big thanks to Smoke for his scripting suggestions to keep those pesky Armour and Weapon Display Cabinets in place and tidy. By: Cryo - For the original Oblivion Indoril Armour. By: Aorawn - For the new textures. Huge thanks. Great for the Ascensyon look. BeldaElysium has been developed for many many years now, and it is getting increasingly difficult to keep track of all the credits. I do make every effort to contact everyone I have borrowed from for permission, when it is not freely given in their work's Read_Me. However, If you see any items/scripts/icons/textures/whatever featured and you are not credited here, please email me and I will gladly add you to the credits. Necromantic forces of The Great Mistress Hhloran. dictate which level Chemie will prowl. ~ A set of Soul-Gems shelves were added to the Main Basement - Magus Room. ~ Lots of polish to existing content. have a more noticable effect when turned on. ~ Locakable Magus and Vault Doors added. ~ Add Blank Audio files to Dialogue. 7 seconds to read text now. ~ Seperate Catsounds into their own BeldaElysium Folder. ~ Add an extra seat to Bath; and improved bath script. ~ Added Deers and Wild Horses outside Elysium grounds. ~ Servants are Now ESSENTIAL by Default. They will then revert back to the SoulGem Method of resurrection. sorting. There are three types, and one type is a Quest object. (Check 5. Technical for slight spoiler details). they die accidentally. Hence, I introduced the Soul Gem method. your Magicka, and is plain comforting to have around. and two separately operated green spotlights. it was decided separate them. ~ Added Large "clutter chest" inside front door. ~ Added banners/paintings and other decorations to all floors. ~ Replaced some statues in house to add more variety. ~ Removed Mermaid statue from basement fountain. ~ Creeping-Ivy decoration on outside house-walls improved. ~ Tweaked outside and inside path-finding. ~ Renamed 'Top' to 'Central' scroll. ~ Tweaked lights in Magus room (off centered). ~ Tweak fire flames in kitchen Stove (more variety of flames sizes). ~ Added new flower pots around the house. ~ General polish of existing content. ~ Added new items to servants room. Giving it more a lived-in feeling. decor/furniture changes, nothing overly extravagant. ~ Added some new plants, candle-lights, seats and banners to the rooms. ~ Reduced the amount of display cases on the desk in the drinks room. ~ Replaced some of the Daedric statues to give more variety. it while in the bath (and in the middle of the bath script). ~ A few other miscellaneous changes. 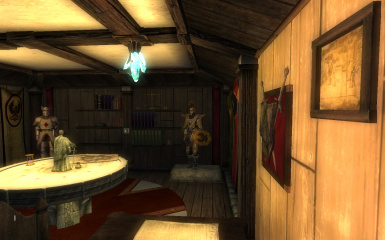 ~ Added "In Character Scrolls" to each room. There is a Key on a Silver Platter, to the left of the Front Door. 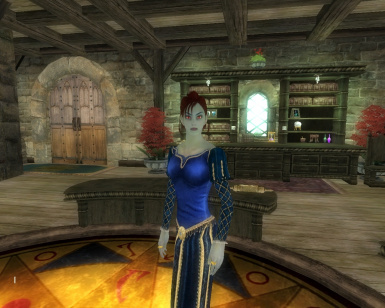 You can also speak to Myrisi'l or Sylvian-Lir to get a Key: They often wander outside, in the Grounds of the Manor. They Do NOT wander outside the Manor Grounds, so you do Not have to go search all over Tamriel for them. 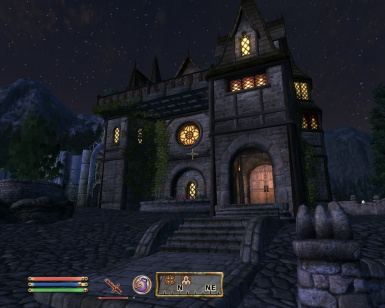 This mod add a 3 level manor house, with a basement, balconies, stables and landscaped grounds next to the Belda Ayleid ruins in the Heartlands region of Tamriel. It also includes two servants, a pet cat and Boney, the Alchemy-Sorter skull, (see below for full details) and several Quests. The KEY to the Manor can be found on a Silver Platter to the left of the Front Door. AND/OR you can get a Key from either Servant Sylvian-Lir or Myrisi'l if you see them wandering in the Grounds of the Manor. ALL containers are safe to store personal items, they do not respawn. 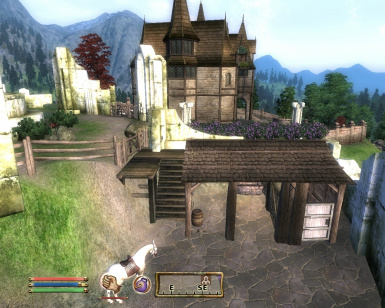 V1.4 Also Includes a Quest: 'Shadows Over Elysium', the Player can undertake. The Quest directly relates to the house and all who live there, but is Not a Quest to get the house. That is given freely to he player and explained why in the Dialogue & Scrolls about the manor. The Adventures of Raimyr and Boney Continue in my Skyrim Let's Play! Wach the new Season: Part 3 Episode 78 - Ascensyon: In the Beginning! 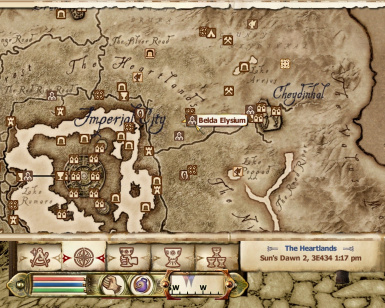 (view the map screenshot included with the Belda Elysium.esp file) If you have already found the Ayleid Ruin "BELDA" (north east of the Imperial City) then simply Fast Travel there, you can't miss the Manor House. Otherwise: Starting from the sewer exit you started the game at, Cross the water in front of you (north east) that leads to the Ayleid ruin "Vilverin", Keep Vilverin on your right and the shore line on your left and head about 30 meters past it to the Imperial "Rod Ring Road". Here you should see a set on white marble stone steps heading up a steep hillside. Follow this path East up the hill and it will lead you directly to Belda Elysium. 1) Unzip the Belda Elysium.rar into your Oblivion/Data folder. (e.g. C:\Program Files\Bethesda Softworks\Oblivion\Data ). 2) Enable "Belda Elysium.esp" in Oblivion's Data Files menu selection. 1) A WORD OF CAUTION:- Items will -normally- be safe inside the house with this update method, but you may want to err on the side of caution and remove all personal belongings from Belda Elysium (inc. stables); otherwise they maybe overwritten and lost. 2) Move to another area well out of sight of BeldaElysium and the hillside-path up to it, ideally an interior cell, and SAVE your game. 3) Unzip the Belda Elysium.rar into your Oblivion/Data folder. 6) Enable your choice of "Belda Elysium.esp" in Oblivion's Data Files menu selection. Simply delete the Belda Elysium.esp file from your Data Folder. Delete the BeldaElysium Folder in FX and Voice. If you are using ILLUMINATION WITHIN (OR WITHOUT) Do NOT DELETE THE TEXTURES/MESHES AS THEY ARE REQUIRED FOR THAT MOD ALSO. 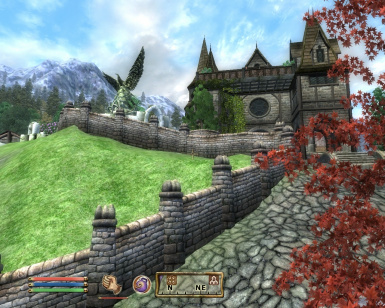 If you are using OBLIVION CATS v0.2b By Tegeal Do NOT DELETE THE TEXTURES/MESHES AS THEY ARE REQUIRED FOR THAT MOD ALSO. the Quest and also a full Walk-Through. NB: the romance quests are hidden and does not appear on the Quest Journal. - "Illumination Within" Window Lights: (Does NOT require the official 'Illumination Within' plug-in MOD to work). Placed on each window of Belda Elysium. "This lights up the house windows in the evening and during dark stormy weather; and turns them off again in the morning. The "glow" of the windows are new meshes (and Lights) overlaid on top of the original window pane, and scripts control when they turn on/off. Night-time with this mod running makes for a totally different gameplay experience." 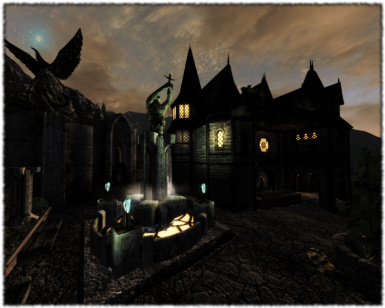 - Large Ayleid Water Fountain; lit up by four Aylied Crystal Lights. 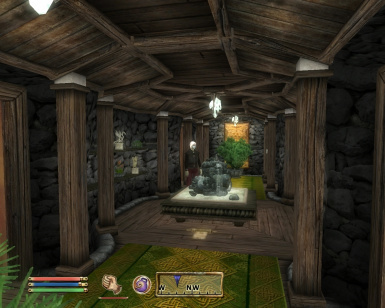 The player can turn on and off the water and lights at will. - Archery Targets in backgarden. Also used by Servant Myrisi'l. - Beautifully designed walled Garden and Grounds built into the side of the Belda Ayleid Ruins. - Rear Ground Level Balcony viewing the eastern valley and waterfalls below. - Small fruit & vegetable garden at back of the house. New to v1.4: Natural Lighting: The ambient lighting in the above ground room slowly change as the sun rises and sets. The basement has fixed ambient lighting. (Players can choose to install Fixed Lighting esp-version if they prefer). I wanted to concentrate on lighting to improve the atmosphere of each area. you in the mood to retire to bed. through the importance contents of each room. There are two Servants, experienced adventurers, that have volunteered to act as tutors/advisers/servants for the player. They are Dunmer Sisters, named Myrisi'l and Sylvian-Lir. This is all explained in their dialogue and "El'Eluril 2nd letter" which you'll find on the cabinet in the MainRooms - Lower. They can be found wandering inside & outside Elysium. 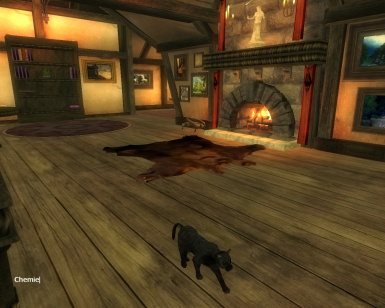 A pet black cat "Chemie", belonging to Myrisi'l can also be found wandering the bedroom and alchemy room upstairs. You will not get all their dialogue at the start, some require time and others charm. New to V1.4. Introduced Affection/Respect Tokens that the player can earn via their actons and dialogue options, from the Sister and Boney, respectively. Without which, gifts and/or further romance dialogue options will not come availble to the player, (this will be expanding further in the next update). ~ Myrisi'l: Battle-Mage, will act as Elysium's Guard. She will ensure that the house in protected during the day and patrols the grounds at night. She will also Recharge Magical items and Tutor the player in Illusionary Magicka. ~ Sylvian-Lir: Cleric of Azura. She takes responsibility for the daily running of the house, gardening, cooking and maintaining the stables. She can tutor you in Restoration Magicka and repair any damage weapons and armour. A) Console Command (if you fancy the Challenge) / setessential <ID> 0 to mark as non essential. Once Non- Essential (meaning they CAN die) and they have take sufficient damage they will fall into a critically injured state. However, they can also be revived from this critial injured state. To do so the player must use a Full GRAND soul Gem. By releasing the power of the gem they will be resurrected. The player can of course choose NOT to resurrect them. Should the worse happen and the player is unable (or unwilling) to resurrect them, their bodies will be buried at the back of the BELDA ruin. A crypt and head stone will be erected to mark their final resting place. Any belongings on the deceased will be transferred automatically to the player. The remaining servant will react to her sisters death! Her disposition towards the player will be severely reduced: you are the Hero after all and are expected to stop this sort of thing from happening. However, there are other ways the player can make amends. ~ Chemie. A black tabby cat. More than a mere pet. Actually a magical entity, owned & created by Myrisi'l. Simply stroking Chemie can bring the player goodluck (Fortify Luck +5/300seconds); Should Chemie be injured, she can be healed my feeding her crab-meat: Chemie will show her appreciation of this treat by temporarily improving the person Magicka (Fortify Magicka 50/300seconds). Finally should Chemie be killed she can be brought back to life! The player must have on his possession a PETTY SOUL GEM filled with a PETTY Soul, (anything else is unsuitable for the ritual and cannot be used. e.g. You CANNOT use a Common Soul Gem filled with a PETTY soul). New to V1.5: 'Chemie' now has a cat-bed on all three levels of the main house. And the player can also instruct Chemie which floor he/she wants Chemie to prowl on. - 3 levels above Ground and two Basements. ~ separate smaller display room, business bureau and drinks counter. ~ Double doors to South-West facing Balcony. 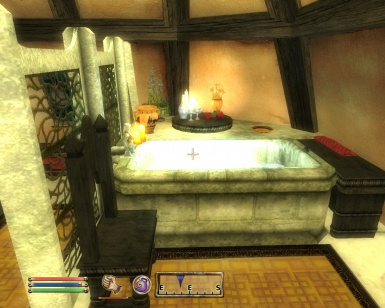 ~ Usable bath: players can sit in the bath for a good long soak, and gain the following Temporary benefits: Fortifies +10 Personality (cleansed), Restores +50 Health (cleans Wounds), Fortifies +50 Fatigue (relaxed/refreshed). To use it, click on the wooden triangle at the head of the bath to get it. Soak as long as you want then press Activate anywhere to bring up the pop up box (Bathe / Cancel),after selecting your option, press activate anywhere again to get out. using the right smellies adds a Temporary bonus of +10 Speechcraft & +10 Mercantile. Using the wrong smelly for your gender gives a Temporary drain -10 Personality. ~ Neat and compact set of Alchemy Containers packed into two Wall-Shelves set into the wall. ~ Book: "The Alchemists Reference". Complete listing of ingredients locations and potion combinations. Can be added to the players inventory. ~ Book: "Alchemical Experimentation by Seryne Relas", A heavy tome that when activated will Temporarily increase the Player's Alchemy Skill by +10. Must be used within the Alchemy room. 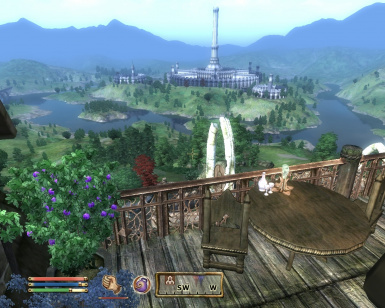 ~ Fantastic view of the Heartlands and the Imperial City. 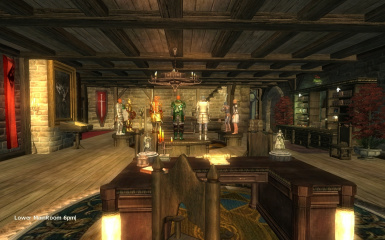 * The Hall and each room has Ceiling Lights made from Welkynd Stone Clusters, which the player can turn on/off at will. 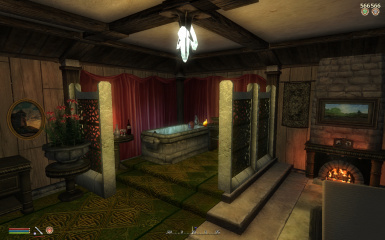 ~ Interior WaterFountains in the hallway which the player can turn off and on at will. ~ Spell Making and Enchanting Equipment (Crystal-Balls instead of the usual Altars). ~ Middle class furnished quarters. 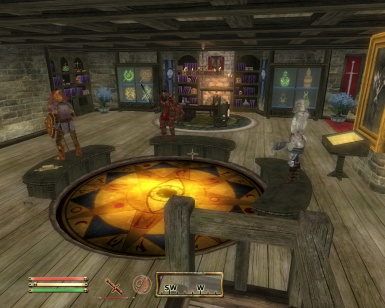 The Hall and each room has ceiling Lights made from Welkynd Stone clusters, which the player can turn on/off at will. ~ High Class Furniture and new Glass Cabinets to store personal items. ~ Large Spacious bathroom, and a little extra for the artistic types. ~ Plenty of shelves and cabinets to display your most valuable items. Securely held behind an enchanted lockable gate. 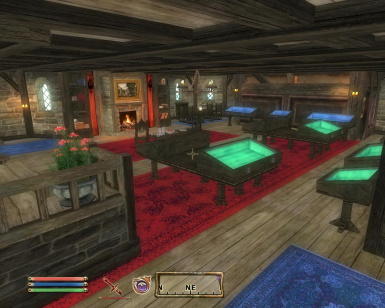 ~ A room dedicated to the planning of your war-effort against the hordes of Oblivion. ~ Continuation of Main Quest:- 'Path of Ascensyon'. 2nd in the Series. An epic quest which furthers the battles between the Saviour of Tamriel and the Necromantic forces of The Great Mistress Hhloran. The Saviour of Tamriel must track down the location of Tel Onyx, to stop further innocent bloodshed,and put an end to the necromantic threat posed by The Great Mistress Hhloran. ~ Chemie (cat), Cat-Bed added to all levels of main house. Player can dictate which level Chemie will prowl. ~ Chief Custodian El'ELuril added as part of Elysium Quest: Path of Ascensyon. This starts the beginings of a romance for Female Player Characters. ~ Dimmed the ambient light in the basement areas. Now the fixed lights have a more noticable effect when turned on. ~ Add 2nd basement Area. Four new rooms - Guest Suite, Bathroom, War Room and Vault. 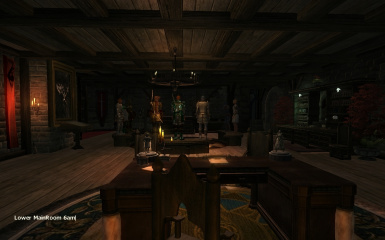 ~ Added Script to Armour/Swords in display cabinets; so they will no longer fall down. ~ Affection/Respect Tokens the player can earn from the Sisters and Boney respectively. Until the Player has completed the Quest arch the Sister have been made Essential, i.e.'unkillable'. Adjusted Boney's Script to ignore certain types of vampire dust when sorting. There are three types, and one type is a Quest object. Many brand new features to this version, and much much more tweaking/polish. ~ Added two "experienced adventurers" to act as servants, all part of house story". They have plenty of Dialogue, the beginnings of a romance element, (more in version 1.4) and a packed work routine each to carry out during the day/night. The reasons the Servants were not made "Essential", that is "Unkillable", is to allow players to dispose of them, should the player REALLY NOT Want Servants in their houses. However, for those players who did want servants I also wanted them to have the ability to resurrect their servants should they die accidentally. Hence, I introduced the Soul Gem method. ~ Added "Chemie", Alchemy black cat. 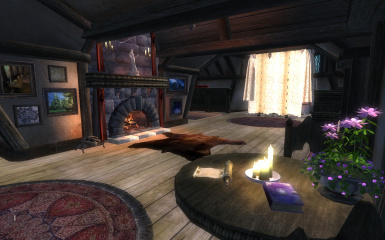 Who can bring you luck, fortify your Magicka, and is plain comforting to have around. ~ Add dialogue/back story to Alchemy sorter "Boney" scripts, both up and down stairs. ~ New Wall-Cabinet add to MainRooms - Lower. Including named Ayleid Casks Individually named to store arrows; also spare general purpose casks and two separately operated green spotlights. ~ Separated MainRooms - Lower&Central rooms. Now they have separate LOADING screen. This was a really tough decision to make: especially after I had spent hours and hours getting them to look right joined together in the first place, (I really liked it how it made the house few very spacey), But with the rooms full of Player clutter it was causing some slow-down. So it was decided separate them. ~ Reduced number of Display cases in Drinks room and in MainRooms - Central. ~ Redesigned the Flower arrangement box in the front garden. (Balancing Lag&Design). 1.2 The main purpose of this update is to improve stability and help out those who have been experiencing difficulties. There has been some minor decor/furniture changes, nothing overly extravagant. ~ Thoroughly cleaned the mod of any unintentional references that had crept in. This greatly increases stability and reduces any possible conflicts with other Mods. ~ Changed the bathroom chair to a stool. To help player avoid clicking on it while in the bath (and in the middle of the bath script). NOTE: This section does contain some spoilers. v1.4 Natural Lighting and Fixed Lighting choice. Why give you the choice? Cos I'm really nice like that. But also because Natural Lighting uses the weather system from Oblivion and if you use another 3rd party MOD which alters the Weather/Environment you MAY see some amusing effects inside the manor. For example you might come home to find its raining or snowing in the bedroom. However, this is purely cosmetic if it does happen and should not have any other bad effect on the game. RESTING/WAITING or Exiting and re-enterign the room should stop this strangeness. "MS40 Vampire Dusk" a.k.a. 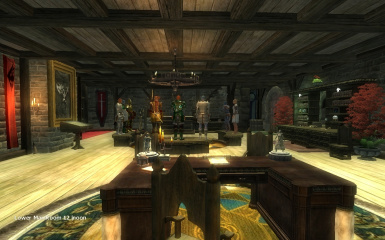 "Ashes of Hindaril", which is required for a Quest. Everything else was correcting spelling errors. The Textures / Meshes new to this update are for the Alchemy Cat "Chemie" . 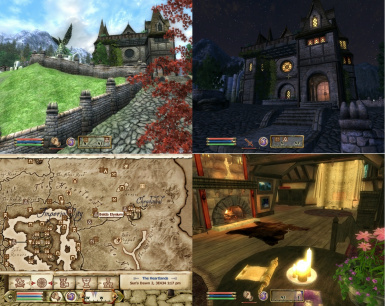 They are direct copies taken from the Mod: OBLIVION CATS v0.2b By Tegeal (see credits). Both servants Do Not Level. They start off at a power level roughly 25-35 and will stay like that for the entire game. So to begin with they will be much more powerful than the Player. They are suppose to be mentors/advisers afterall. Then eventually the Player will surpass them in skill. * Blank Audio file have been added that will stop the text dialogue skipping too fast to read comfortably. Now you will have 7 seconds to read the text. You can of course click through the dialogue if it is going too slow. If you have the RING / BOOK and a great disposition BUT not completed atleast this part of the main quest; the Companion will tell you its "too soon". The whole purpose of these Quest-Stage settings is to give pacing to the 'friendship/romance': so the player cannot get all the dialogue option all at one time. Simply to try to make it more realistic. If the companion has 'died' (critically wounded), but has not been buried (which the player has to chose Dialogue option: NO -Ashes to Ashes) then it will run the critically injured Dialogue. Upon the sister being buried the Player received a "Death Token" which is a quest item WHICH SHOULD NOT BE REMOVED: It tells the Mod that the Companion is Dead & Buried (permanently) and will run the "Sister is Dead dialogue options". This "Death Token" is a QUEST ITEM so cannot be removed from the players inventory 'normally', (There are some mod tools which do allow this). The alive sister also gets a "Death Token" added to her inventory. This is checked for by one of her packages to tell her that her sister is dead and buried and she should pray at her gravestone sometime during the day. SO DON'T PICKPOCKET IT FROM HER. It wont hurt the game, just not allow her to grieve. Again this is for TIMING PURPOSES: This proves that the Player has seen Akatosh's Chapel which Sylvian-Lir referred to as being destroyed. * The Textures and meshes included in this file are for the Glowing windows on the outside of the Manor House. They are direct copies taken from the original creators of Illumination Within (see credits). IF YOU ALREADY HAVE ILLUMINATION WITHIN (OR WITHOUT) V1.0 BY SLAP (and ModMan) INSTALLED THERE IS NO NEED TO INSTALL THESES MESHES/TEXTURES, AS THEY WILL ALREADY EXISTING IN THE CORRECT FOLDERS. 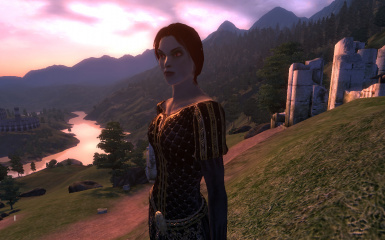 * If you have not already, it is recommended that you update to Oblivion Patch 1.1+, if you are experiencing problems. Some players have claimed that this stopped problems they were having. * There are no known conflicts with this Mod. The Mod does not effect any quest items or there locations. * For best results use HDR lighting. * I tried to keep the objects in the house that give bonuses at a low level. Something which is helpful, but not over powering.